No matter how many cats you have, an odor-free home starts with Arm & Hammer—the odor elimination expert! 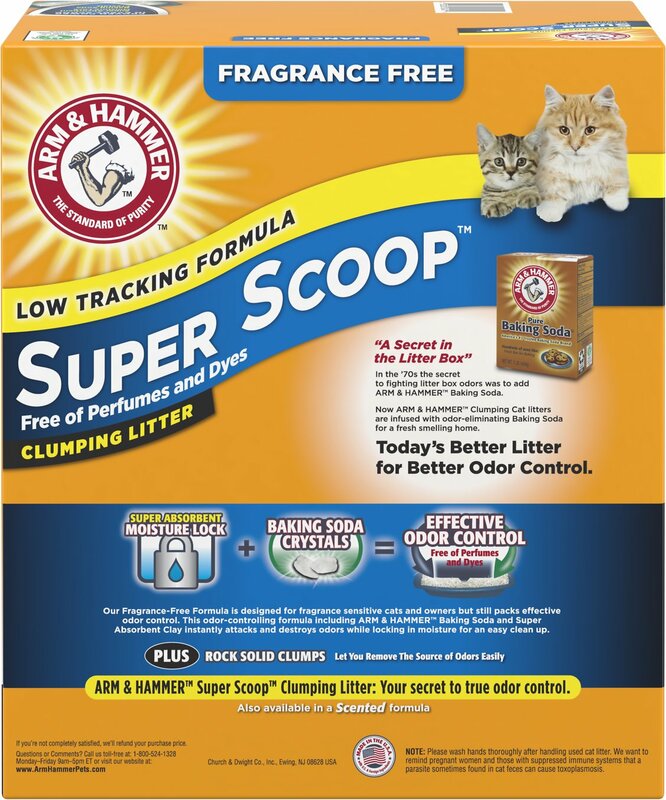 Arm & Hammer Litter Super Scoop Fragrance-Free Clumping Litter is a fragrance-free litter specially formulated for pet parents and feline friends who are sensitive to scents. This 99% dust-free formula contains baking soda crystals and special odor neutralizers, which work to eliminate the most stubborn litter box odors on contact. Best of all, not only will your house stay odor-free, but the strong clumping formula makes clean-up especially easy after each use. Upgrade your kitty’s litter and kick foul odors to the curb with this Arm & Hammer cat litter, he deserves it! 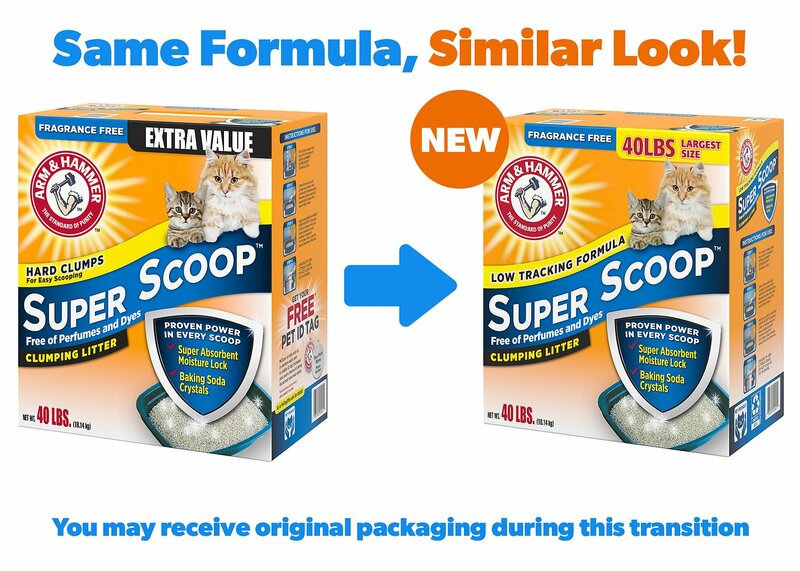 Super Scoop formula is powerful enough to fight stubborn ammonia odors before they start. 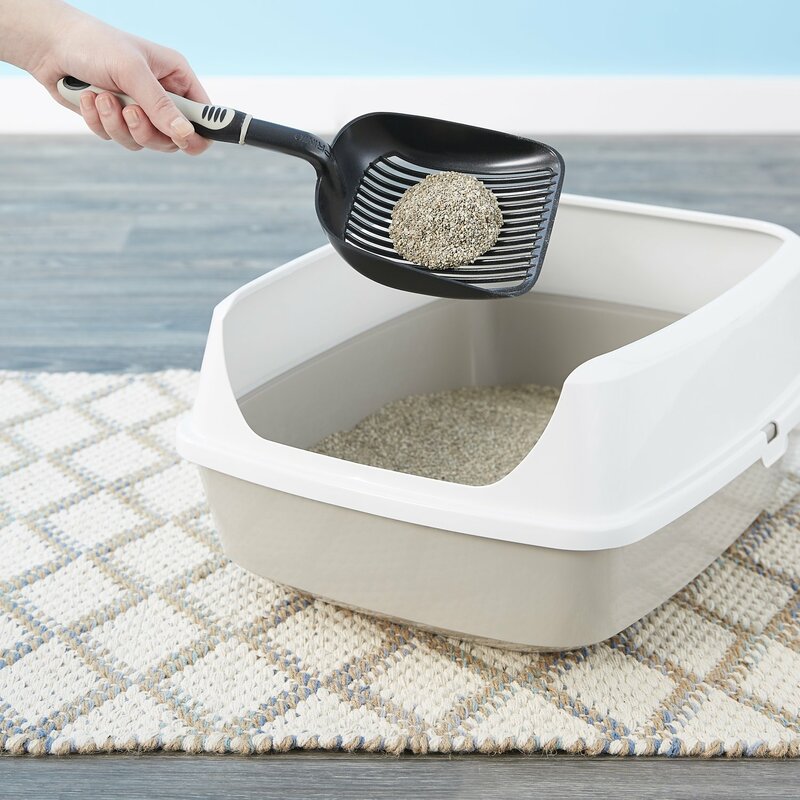 Infused with moisture-activated baking soda to destroy kitty litter box odors—a trick that has been used since the 1970’s! 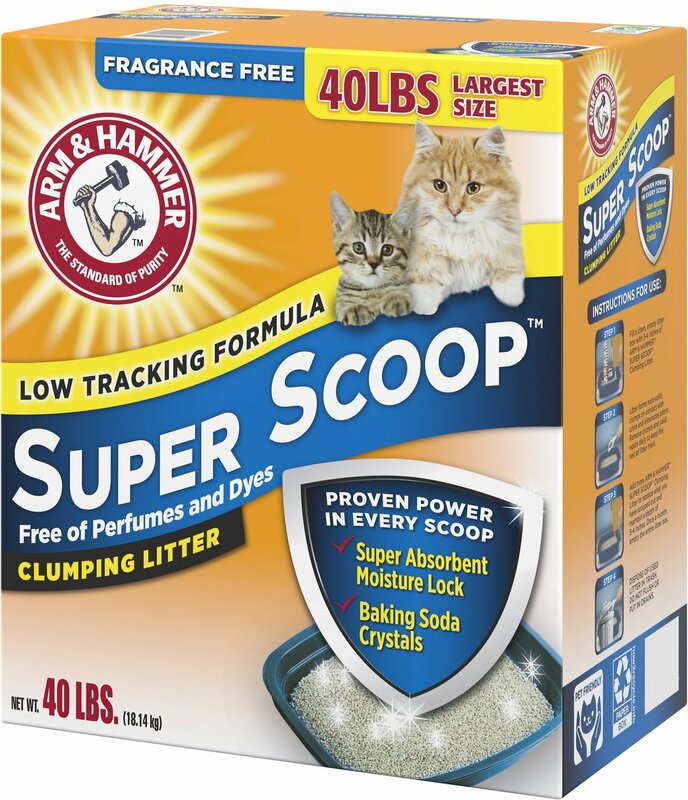 Fill a clean, empty litter box with 3 - 4 inches of ARM & HAMMER™ Super Scoop™. Litter forms rock-solid clumps on contact with urine and controls odors. Remove clumps and solid waste daily to keep the rest of the litter fresh. 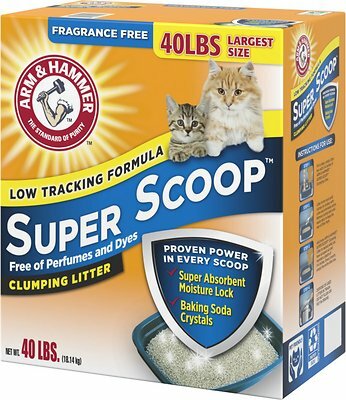 Add more ARM & HAMMER™ Super Scoop™ at litter to replace what you have scooped out and maintain a depth of 3 - 4 inches. Once a month, empty the entire litter box. 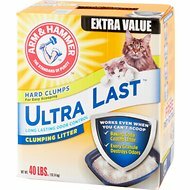 To transition you cat to use Arm & Hammer Litter: * Fill a clean litter box ¾ full of Arm & Hammer Litter. Next, pour one to two inches of your old litter brand on top. Don't mix! Your cat will do this naturally as she uses her litter. * Allow your cat to use the mixed litter until the next time you change the box. * Your cat should be acclimated to Arm & Hammer after just one use, but some cats can need a little more time. 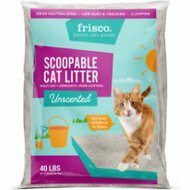 It used to be the best litter, but for about the last 6-8 months or so, it lasts a shorter time for the same purchase size, turns into HARD concrete (have broken 2 scoops with this stuff), and tracks horribly! Still looking for a good unscented litter that doesn't do what this one does (the negative parts that is). It does a pretty decent job with odor, but the pee will actually make little lakes up on top of the litter where they just went earlier that day (they like to pee in the same spot in the box). Have to manually cover up the lake before I attempt to scoop up the concrete it makes. Not a fan of this litter! I needed a litter to replace our other fragrance free litter. The other name brand litter changed something in its ingredients and I have a couple of cats that are scratching and losing hair. Having tried all other options, we are now trying to change the litter as most of their paws are affected. Arm and Hammer doesn't seem to leave an ammonia odor which is great. It took a week for a couple of the cats to accept the new litter. So if you change, mix the litter 1/2 and 1/2 because the texture is different. We clean our boxes daily as well. I am just glad there is a brand that the cats have an option to change to and that doesn't stink the house up. I am usually an Arm&Hammer fan, but this litter was not good at odor control. I scoop litter twice a day every day and it still would not control the smell. Hence the ordering another brand before my scheduled shipment. And I have to use unscented because one of our cats has allergy to the scented. I purchase this all the time at a "big box" store, and finally came to my senses and have ordered (and auto-order) from Chewy. Less lugging it from my car, up stairs, to my door, etc. I have two cats, and this keeps all smells under control. Clumps well, and I like that it is unscented. The cats like it too! This litter is great! We have five adopted cats that use one litter box. This litter clumps with no issue. No smell when they use the box. Would recommend this litter to anyone. 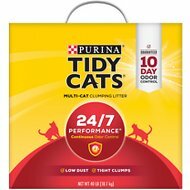 We have tried so many different litter products and this is the one to use with multiple fur babies. I had been using scented litters with no problem, but I read that cats don’t prefer it. I switched to the unscented, a little worried that the house would smell like cat, but it’s been absolutely fine. The price on this exact product was considerably more at other places I shop as well. I switched up my litter to see if there's a better one for my household and regret trying this brand. The odor is awful, it either clumps like cement or doesn't clump at all, and is so dusty that my kitten is sneezing. The litter granules are so large that it gets tracked everywhere. I have a 3 cat house with 4 boxes, do not recommend. I have tried three kinds of litter for my cat and this is the best. It is cheap, utterly odorless (as far as I can tell), and clumps really well. Previously I bought an organic grain product but I suspect that its low level dust triggered my asthma. Super Scoop doesn’t bother me at all. Having it on auto ship is convenient. I wanted this to be great, because of the Arm & Hammer connection. But it was only so-so on these fronts: solid scoops, odor control, dust, and tracking. I'm at my wit's end trying to find a product that works for both me and my cat, and so the search continues.